In 1936, there are paranormal abilities that have slowly seeped into the world, brought to the surface by the suffering of the Great War. The research to weaponize these abilities in England has lagged behind Germany, but now it's underway at an ultra-secret site called Monkton Hall. Kim Tavistock, a woman with the talent of the spill - drawing out truths that people most wish to hide - is among the test subjects at the facility. When she wins the confidence of caseworker Owen Cherwell, she is recruited to a mission to expose the head of Monkton Hall - who is believed to be a German spy. As she infiltrates the upper-crust circles of some of England's fascist sympathizers, she encounters dangerous opponents, including the charismatic Nazi officer Erich von Ritter, and discovers a plan to invade England. No one believes an invasion of the island nation is possible, not Whitehall, not even England's Secret Intelligence Service. Unfortunately, they are wrong, and only one woman, without connections or training, wielding her talent of the spill and her gift for espionage, can stop it. 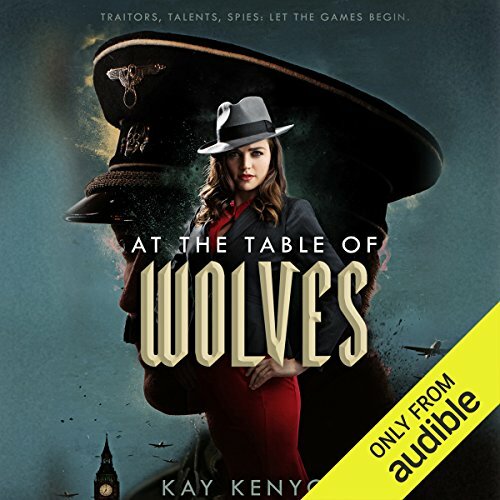 ©2017 Kay Kenyon (P)2017 Audible, Inc.
Not usually my genre, but.. Yes, because the story line was really interesting and the narrator is my favorite. What other book might you compare At the Table of Wolves to and why? I had not read one like it so that was a good thing, it was a new flavor for me. I would listen Nicola Barber read the label off a soup can, that is how much I like her voice. This is the real cold war! First time for author, can't wait to listen to the next book when it comes out at audible. Nicola Barber, 'nuff said! I have been an audible subscriber for some time and have listened to over 20 books. This is by far and away the best narrated story to date. I absolutely loved everything about it and could not recommend giving it a listen more. 5 stars! Kay Kenyon's prose is great and I would've enjoyed the book more, but I found that the story was slow to get going... I also felt that our protagonist, Kim Tavistoc, (generally a pretty smart woman) was a bit too slow in figuring out a couple of key things... but once she cottoned on to the facts, the story got much better! I loved Nicola Barber's narration! She gave a great performance!